Quote Reply Topic: First time out on the beast. It wasn't far but I did it. I got out and rode my V7. It's been almost 6 months since my accident and it was good. I have never owned an “upright” bike before so it was always going to be different. What with that, going back to a gearchange on the right, drum brakes and all new riding kit including a new helmet made everything feel a bit weird. The weirdness lasted all of half a mile! I soon got into the swing of it. It may be a bit of a beast but it seems to have a fair turn of speed and the brakes are thankfully adequate. I might have to do something to the brake pedal as it feels too low. I don’t think I can move it on the splines as the starter motor is in the way. I might have to fasten a block to it. I called round to see “Gerwyn the tyres” and we agreed that I should replace these. They are at least 20 and possibly over 30 years old. Date codes are pre 2000 type and could be for '91 and '93 or even '81 and '83. The bike left government service in '86 and has had virtually no use since then so the 80s is really possible. He couldn’t match internet prices so I’ll get ‘em and he’ll fit ‘em. Tucked up for the night. A loop will bore into your soul.Dunno why, but they have a certain je ne sais quoi,or as it's said in my homeland,"Ahh divvent Knaa wot." Anyway,glad you enjoyed the ride and many more to come!! Great to see you out and about on a bike again. I keep thinking, every time I see it, "it's very red, isn't it!" Congratulations. It makes you feel alive again when you get back on a bike. I've just noticed on the rear view the tiny pee holes on the silencers wow, what do they sound like ? has anyone else seen the vindorado Billy Joel has? a cali vintage that has the tank/side panels and such made to look like an Eldorado? Still sounds like a typical Guzzi! Perhaps a little bit tinny. I read somewhere that US bikes had the ends of the silencers cut off before plating to make the holes bigger and let a bit more noise out. My mate, Bunny, said it sounded like his old Ural! My loop has just been bought a 1950 steib zeppelin sidecar, thats a mess too. 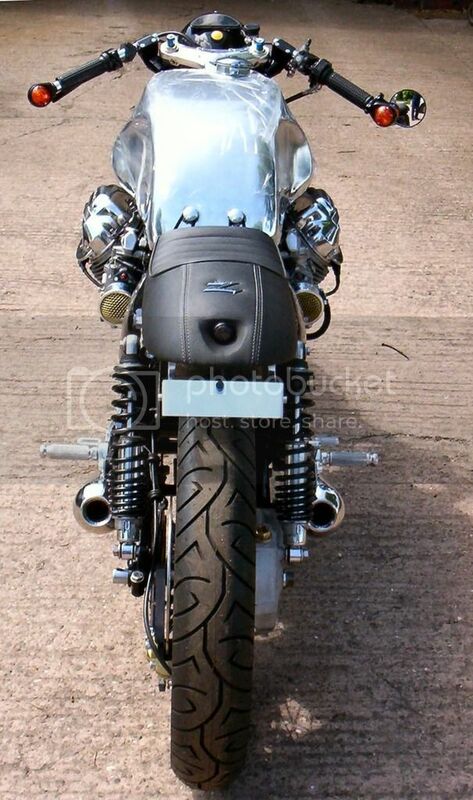 Guzzi:- V7 loop/ Quota/ Cally solo/ Cally outfit/ Nuovo falcone/ V75sp, and some other stuff too. Expensive but just the job! Looks like the big seal has let go in the drive box. I've had 3 Guzzis with 4 drive boxes and this will make 4 times I've had to do this job. Replacing the seal's not hard but, it's usually failed because there's a rust spot somewhere on the drive hub. Out of the 3 I've done before - 1 cleaned up with a scotchbrite pad, 1 had a pit filled with epoxy filler and 1 was so bad it had to be replaced. Wonder what I'll find this time. It's a nuisance but it's what you get when you run a bike that's stood unused for quite some time.